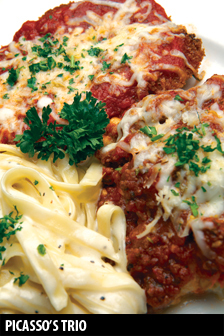 A feast of our heartiest favorites ~ Lasagna, Fettuccini Alfredo and Chicken Parmesan. 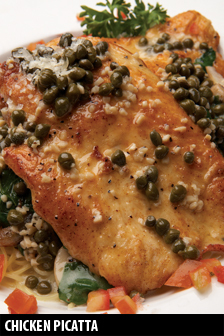 Lightly breaded and sautéed in a lemon butter caper sauce with spinach, mushrooms and onions over angel hair pasta. The ultimate meat sauce with chopped Italian sausage, basil and a touch of cream. 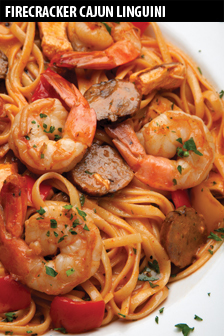 Jumbo shrimp, sliced link sausage and chicken with red and gold peppers in a spicy New Orleans style sauce. 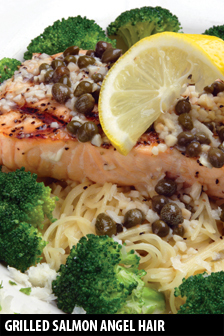 8 oz salmon filet, fire grilled and served on a bed of angel hair with lemon butter caper sauce and steamed broccoli. 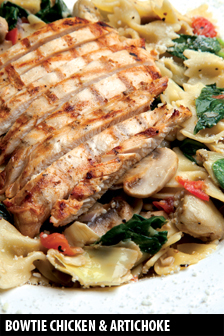 Grilled chicken breast, artichoke hearts, spinach, mushrooms, garlic and grape tomatoes, sauteed in olive oil, lemon juice and white wine. Succulent scallops sautéed with seasonal vegetables, served over linguini in a lobster cream sauce. Julienned squash, zucchini, red and gold bell peppers, with sauteed mushrooms in cream sauce. Tender breast lightly breaded and sautéed in lemon marsala wine sauce with spinach, mushrooms and onions, served with a side of linguini marinara. 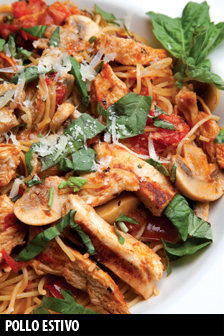 Sliced chicken and mushrooms, fresh diced tomatoes, garlic and fresh basil in a light Pomodoro sauce. Sautéed chicken in our spicy sweet honey barbecue sauce with carmelized red onions, a touch of cream and fresh cilantro. Unique and delicious. Tender grilled steak, Gorgonzola crumbles, sun-dried tomatoes and spinach in a parmesan cream sauce. Great New Recipe! Jumbo shrimp sautéed in white wine butter sauce with fresh garlic, parsley, shallots and a touch of fresh lemon juice over angel hair pasta. Great New Recipe! Angel hair pasta with fresh diced tomatoes, garlic, basil and a touch of balsamic, topped with creamy goat cheese. *Deluxe & Gourmet toppings are an additional charge. Our version of some timeless favorites. 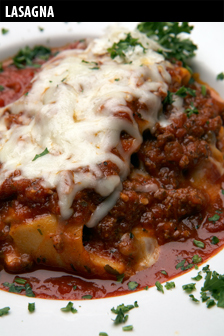 Layers of noodles, ricotta, homemade meat sauce and mozzarella, smothered in red sauce. Hand breaded and covered with our flavorful marinara sauce and mozzarella cheese with a side of spaghetti marinara. With your choice of our NEW homecooked meatballs, meat sauce or Italian sausage in marinara sauce.